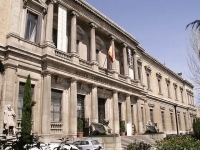 A worthwhile visit in a country known for its rich history, the National Archaeological Museum was founded in 1867 with the purpose of being a depository for the collection of numismatic, archaeological, ethnographical and decorative art collections compiled by the Spanish monarchs. Situated in a stately neoclassical mansion alongside the National Library, the museum's collection ranges from prehistoric times to the 19th century. One of the major exhibits is the famous Iberian statue, The Lady of Elche, a carving from the 4th century BC found on the southeastern coast of Spain. Other intriguing exhibits are the Islamic collection, outlining the long and influential history of the Moors in Spain, and the replica of Altamira Cave, inhabited over 18,000 years ago, with rock paintings depicting bison, horses, boars and human handprints. The replica of the cave can be found in the garden and is particularly notable because the original has been closed to the public to prevent deterioration. The museum also holds interesting collections of Visigoth, Roman and Greek artefacts. With three floors of exhibition space, this museum is a treasure trove for those interested in the archaeological history of Spain.